During the Christmas season, it's important to think of those who have helped to make your business a success. Your staff, your customers, and the businesses you deal with have played a key role in your prosperity this year, and you will want to let each and every one know just how much you appreciate them. This Christmas season, give corporate gift baskets as a sincere gesture of your appreciation. A corporate gift basket is the type of gift that is appropriate for presenting to anyone, whether your support staff, your vendors, customers both large and small, and even people that you hope to do business with in the future. One of the best things about giving corporate gift baskets is that you can decide what to give. You may want to present a corporate gift basket that contains fruits, as a symbolic celebration of the prosperity you've enjoyed. 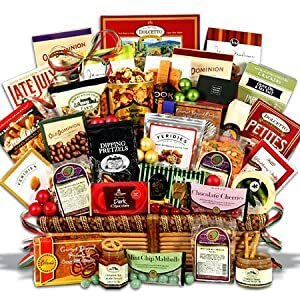 Other types of gift baskets that would work well are cheese, or cheese and meat baskets: wine baskets, candy baskets, cookie baskets or coffee baskets. Fruit can be a great feature for a corporate gift basket. A fruit basket can be used as a centerpiece at an office party. Everyone enjoys a fresh piece of fruit, and when you give a gift basket containing fruits, you can be sure your gift won't go to waste! Cheese or cheese and meat baskets also make excellent corporate gift baskets, offering variety and flavor. People who receive these often share them with friends and associates, giving you some good press in your industry. A corporate gift basket that contains wine is a sophisticated gift indeed, and often come packed with additional treats like crackers, cheeses, meats and candies. Cookie and candy gift baskets are among the favorite type of corporate gift baskets to give. These are often placed in a highly visible spot for everyone to enjoy. Finally coffee gift baskets make excellent corporate gifts. What office doesn't have a coffee pot that is always on? Flavored and specialty coffees, and tea and hot chocolate can be the way to a customers heart! When you send out a corporate gift basket, whether it's for the holidays, to celebrate closing a big deal or the beginning of a new business relationship, don't forget to send a personalized card along conveying your heartfelt appreciation. Your business associates will appreciate hearing from you, and the card will stay with the basket until the very last morsel is gone, letting everyone know who the generous gift-giver was. Corporate gift baskets make a great way to send holiday greetings to your staff, your staff in satellite offices, vendors, and customers alike.